The Order of the Argent Scales (OAST) is given for excellence in administrative service. 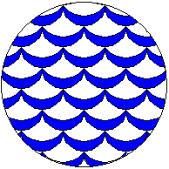 of the Order of the Argent Scales Trimaris. 4.) Those who work for the good of Trimaris enable all to enjoy the fruits of their labor. Lest their toil, by its very nature unseen, go unnoticed, We, the Crown Trimaris, so name Our loyal subject ______________ as a Companion of the Argent Scales Trimaris, for excellence of service to this, Our Kingdom. In witness We set Our hand and seal this _____ day of _____, A. S. _________.